Tax break for Citroen-Peugeot hybrid | What Car? Cars using the Citroen/Peugeot diesel hybrid system will be exempt from the 3% company car tax penalty that's usually levied on diesel cars. This means company car drivers that choose a Peugeot 3008 Hybrid4, 508 RXH or a Citroen DS5 Hybrid4 will pay the same level of company car tax as those with the petrol equivalent. 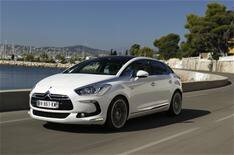 Citroen's DS5 and the Peugeot 3008 both emit from 99g/km of CO2, while the 508 RXH will emit 109g/km, meaning they will all qualify for the 10% tax band. The Peugeot 3008 and the Citroen DS5 will also be zero-rated for road tax and exempt from the London Congestion Charge. Peugeot's 3008 diesel hybrid is on sale now, while the Citroen DS5 and Peugeot 508 RXH Hybrid4 go on sale early in 2012.